Before I resolve some questions asked by a few of younger acquaintances about electric guitars — specifically, “tell me the difference between single-coils and humbuckers?” I’d like to digress a bit to discuss a new back pack and North Face fleece I just purchased. Actually I specifically want to focus in on the North Face logo. I’m pretty sure you are all familiar with this brand whether you run, climb, ski, snowboard, or do none of the above but live in a climate that requires a jacket or other clothing to keep you warm during the cool/ cold winter months. I had never taken a good look at the North Face logo until yesterday. It’s basically the words: The North Face with three slightly skewed quarter-circles along the right side. Graphic, clean. I didn’t think much about it, till a friend who is a graphic designer said: Those quarter circles represent Half Dome in Yosemite! Whoa, that’s cool. Apparently, the name itself alludes to the north face of mountains in the northern hemisphere which are generally the most difficult face of a mountain to climb. Anyway, back to the topic of single-coils and humbuckers differences. However, that’s maybe not what my teenage colleagues were wanting to know. The thing that they could be talking about is the difference of tone, once you understand what they’re listening for. Humbuckers are ‘fatter’ than single-coils. 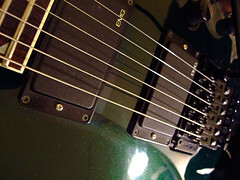 Comparatively ‘brighter’ and ‘thinner’, single-coils normally permit the guitar to be heard more clearly after the amplification process (in addition to noise and hum), while humbuckers distort much more readily, yet tend to integrate more easily (that is to say, the tone of humbuckers are likely to blend in easier with the amplifier and effects). It was suggested to me to listen to players like Mark Knopfler or Jeff Beck for the unmistakable sound of single-coils, and for humbuckers the variety comprises players from the mellow round sounds of Lee Ritenour and then the Allman Brothers all the way to Metallica. Perhaps this will supply you something to go on. I’m off for a skate this afternoon (wearing, of course, my North Face jacket). I’m planning on listening to a playlist with Mark Knopfler, Jeff Beck, Lee Ritenour, and maybe a bit of Metallica, just to see if I can discern the single-coils, and for humbuckers. I have a running bet with my graphic artist friend to see can pick out the most riffs that used single-coils. Perhaps skating will be a bit distracting. We usually sit in a quiet room when we are seriously into our listening competition! See you later!